When you're traveling around the world, it's good to know that there are public transit systems available to help you get where you want to go. Underground subway systems offer the convenience of getting where you want when you want without the hassle of having to flag down a taxi or rent a car. In just about all cases, it's the most cost effective option. 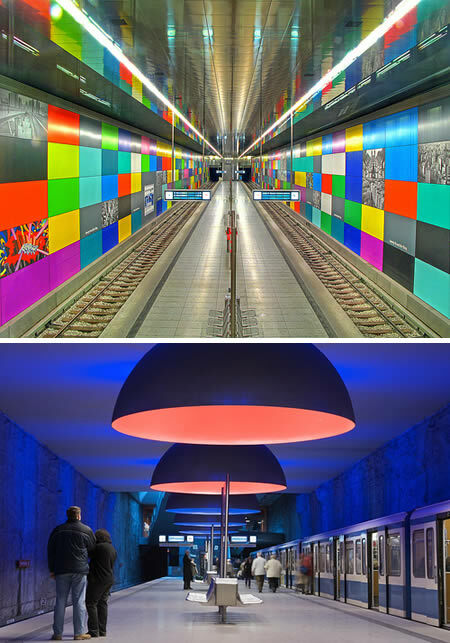 There are some beautiful, modern, and vast rapid transit systems throughout the world. 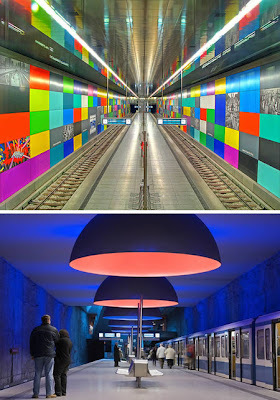 The most popular and diverse international underground transit systems are listed below, but are merely a sample of the quite eye-catching transit systems that exist throughout the world. `Subway stations are usually designed in a clean and modernistic style in order to make people forget they are traveling deep underground. 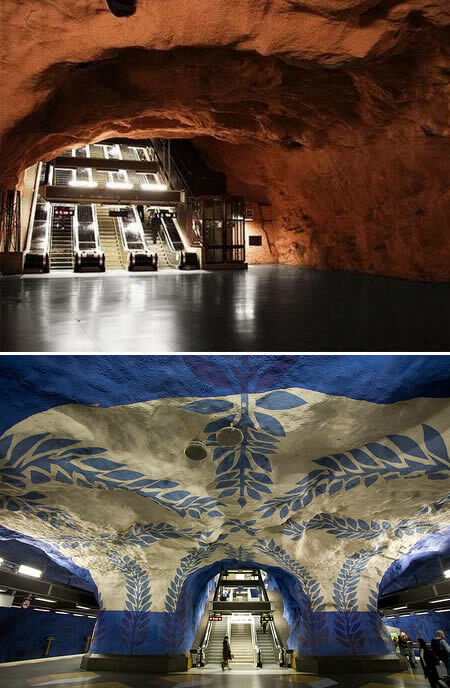 It is different in the Stockholm subway though, in which several of the deep underground stations are cut into solid rock which were left with cave-like ceilings. Oldnature meets nextnature. The fine ‘cave paintings' make the finishing touch. Munich Public Transport System (MVV) is a splendidly constructed system consisting of dozens of S-Bahn (suburbian trains), U-Bahn (subway), Tram-Bahn / Straßenbahn (streetcar) and bus lines, connecting all parts of the city perfectly. This metro system has been opened in 1972 and has spacious and clean stations. The earlier ones are rather minimalistic in design while the later ones got more interesting architectural features and some works of art. This has to be one of the most surreal, psychedlic and fun forms of public transport. The Tunnel connects East Nanjin Rd on the Bund, and Pudong near the Oriental Pearl TV Tower, running under the Huangpu river. 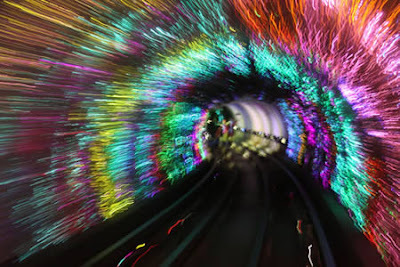 It's a psychedelic trip in a glass capsule along the 647 metre flashing, strobing tunnel. 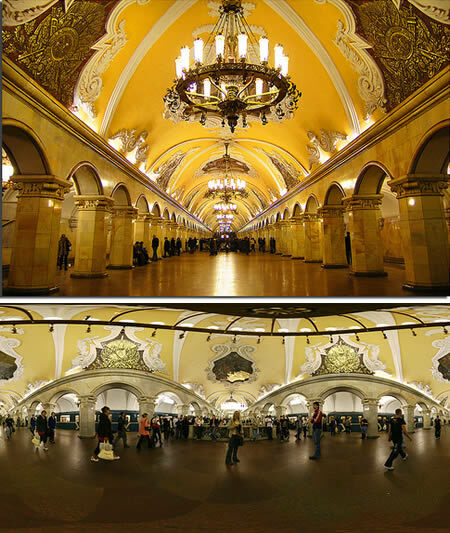 The Komsomolskaya station of the Moscow Metro is the most famous of all those on the Koltsevaya Line and of the whole system, and an icon of Moscow itself, partly due to it being located on Moscow's busiest transport hub, Komsomolskaya Square, which serves three railway terminals: Leningradsky, Yaroslavsky and Kazansky. The station's connotation is of a gateway to Moscow and to the rest of Russia, and its theme is of the patriotic history and inspiring future of the nation. It was opened on 30 January, 1952, as part of the second stage of the Ring line. 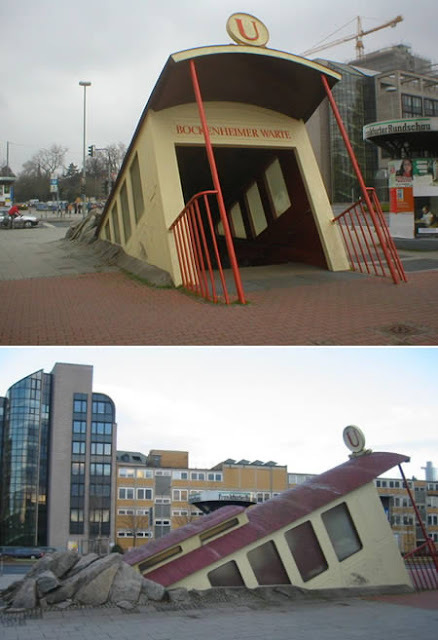 A weird subway entrance, looking like a train bursting through the sidewalk from below, is located in Frankfurt. Architect Zbiginiew Peter Pininski reported he felt inspired by surrealist artist René Magritte when creating it. Bilbao, a small city in the Basque region, is proud of their subway system, not only because of its speed and efficiency, but also because of its design. Norman Foster, the architect who did the Reichtag in Berlin, the Gherkin in London, and the world's largest airport in Hong Kong, designed Bilbao's metro stations. The stations are well-lit and spacious. Foster uses a simple, yet aesthetically pleasing design, especially with the support beams, staircases, and lights. The entrances are especially unique. Nicknamed “el Fosterito,” the entrances are glass round tubes that emerge to the street level. While the stations of the subway are now often dirty, ugly, and are marginally welcoming places, this is not always the case. New York City once had the imagination to build stations which were beautiful as well as practical. 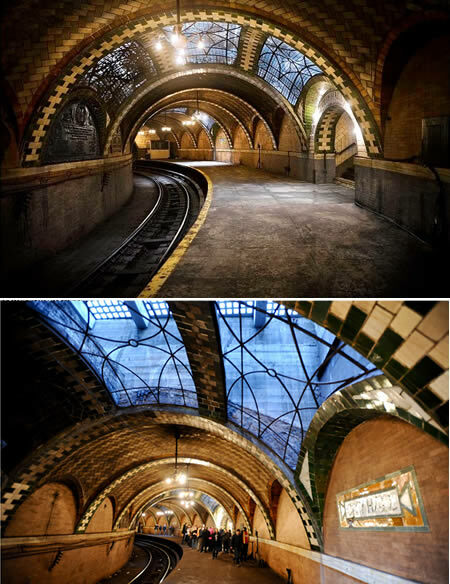 The City Hall station remains the most impressive subway station in New York, and yet it hasn't been used since 1945. The O'Hare terminal station was built in 1984, looking toward the airport terminal from the platforms. 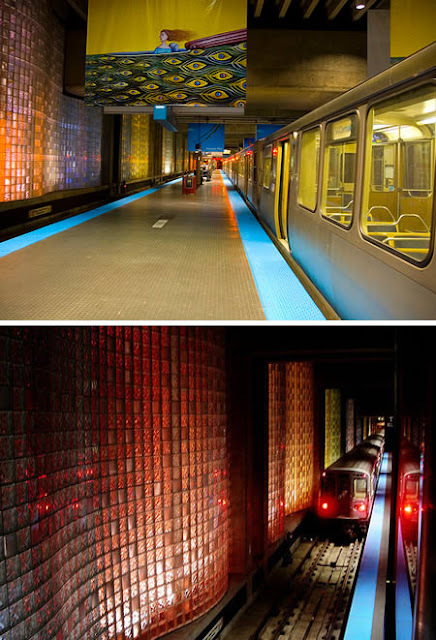 The curved sidewalls of glass block, backlit in different colors, illuminate the platforms and absorb sound in the station. The stairs and escalators at the end of the platforms ascend through a gray metal wall that mimics an airplane fuselage to deliver passengers to the fare controls and out into the airport terminal. 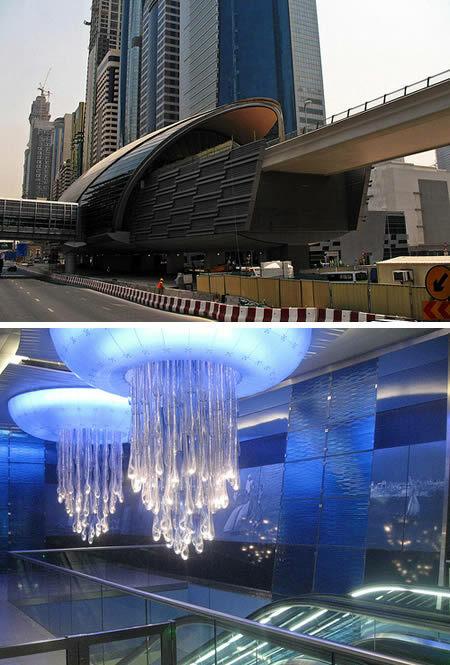 The elevated and at-grade Dubai Metro stations combine both heritage and modern designs. They have been modelled on the shape of seashell, inspired from the diving and pearl-fishing heritage of the UAE, while the interior design depicts the four elements of nature – water, air, earth and fire. Conceptual design of some stations includes traditional architectural ingredients used in antique Arab buildings such as wind towers, oriels, alleyways or internal arches. 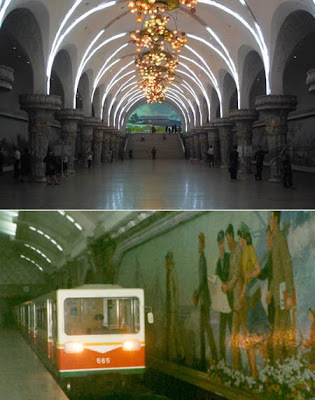 Built to link secret underground military facilities, the Pyongyang Metro is nevertheless an important part of the transport infrastructure in the capital of North Korea (officially, the Democratic People's Republic of Korea or DPRK). There is evidence that it includes secret government-only lines, although the extent of these, if they exist, is unknown. Its station architecture is among the most attractive in the world. However, relatively little is known about the Metro outside the country, as few visitors are able to investigate the system. Using Car Rental 8 you can get affordable car hires at over 50,000 locations across the world.